So so so powerful (ever since 2012), SO easy to understand, YET so so so under-utilised by the majority of the users of Azhagi+, including the tech-savvy ones. If you go through the primer below wherein I have attempted to make you all easily understand the Power and Potential of these XML files, you yourself will understand how much you missed out by not utilizing them (OR) how much somebody else missed out by you not sharing the immense utility value of these xml files with them. There is nothing mystical or "too too too" technical about XML. NOTHING AT ALL. XML files are just like the html files (e.g., http://azhagi.com/indic.html) which you visit on the net, Day in and Day out. Instead of ending with ".html", xml files end with ".xml" and are viewable in your browser. That is all to it. Nothing more. So, as such, you are already supremely familiar with XML files. Only thing was that you were/are not aware of that. Considering the above, even a child can handle an XML file. Similar to how a child takes one step after one step and finally starts walking briskly with a big smile on it's face as though it made a big achievement, you can also learn it step by step. And, feel finally "Oh... is that all?" Kindly visit the above page in your browser and read what it says. I think the contents of the page are self-explanatory. Well, if you had keenly read my 'XML' steps given up to this point, perhaps you would have understood the following. XML files are very simple text files which one can type out by oneself in 'Notepad' application. XML files just contain mapping information, as far as Azhagi+ is concerned. They tell Azhagi+ what to display when 'a' is pressed, what to display when 'b' is pressed, etc. When a particular XML file is used by Azhagi+, it displays characters according to the mappings in that file. So, now we have to make Azhagi+ utilise the XML files we created earlier. To download it and move it to the required directory, kindly visit http://azhagi.com/xmls/primer/xml-downloads-1.html and follow the simple steps therein. Once you have completed the steps correctly, you will have the file 'AzhagiPlus-Tamil-Unicode-DivineMantras.xml' in the 'azXMLs' folder* of Azhagi+. If you have accomplished this, well, you are almost there! (*) See screen snapshot below. Once you have started your Azhagi+ application, your opening screen will appear with a new LFK added. Please see screen snapshot below for better understanding. Particularly, please see the arrows. You see the newly added LFK (Tamil+Unicode+DivineMantras). Right? Now, proceed to the next step. By default, F10 is the global hotkey in Azhagi+. Please see screen snapshot below. If it is 'F11' or any other key in your system, so be it. Now, keep the highlighted area in your Azhagi+ screen exactly same as you see in the screenshot below. That is, the highlighted LFK should be on 'Tamil+Unicode+DivineMantras'. Now, do not close Azhagi+ or do any other changes to it. Start any other application. For our purpose, let us consider you started the 'Notepad' application. In the usual editing area of Notepad, press 'F10' (or whichever hotkey is the global hotkey of Azhagi+ in your system). Type 'a', 'o', 's', 'n', 'm', each of them followed by <enter> key to see what happens. You will see அன்பு, ௐ, நமஷிவாய, முருகா, சாய்ராம் appearing - as you see in the following small video. If you proceeded till the above step and succeeded, there you are! You have achieved adding an XML file to Azhagi+ and utilising the mappings contained in it for typing in any external application. Well, the above xml files are just some sample xml files with some sample contents. It is not that the XML files will always contain 4 or 5 lines only with mappings for some 5 characters only. XML files can contain lots of lines by which one can generate even an entire writing system for any language. That is what the XML files in the data* directory of Azhagi+ contain now. Each file contains an entire writing system for a particular language. Kindly navigate to this "data" folder, click an XML file and view it in your browser. Just have a look. It will give you a clear idea. All the abovesaid XML files are available for online viewing too - at azhagi.com/xmls/#xmls. For e.g., just have a look at azhagi.com/xmls/nph/Aplus-Tamil-Unicode-Tamilnet99.xml. Having said the above, it does not mean that XML files can be used only for generating writing systems. They can be put to a variety of uses. A medical dictionary, a database of mathematical signs, a table of divine names, a list of various symbols, a collection of important items, etc. etc. etc. And while typing in your preferred language in any application, you can readily access and type any of these just at the press of an hotkey!!! Kindly think over this. How beneficial!!! How much it will increase your productivity!!!!!! What the above point means is that 'Language', 'Font Encoding' and 'Keyboard Layout' are broader concepts. 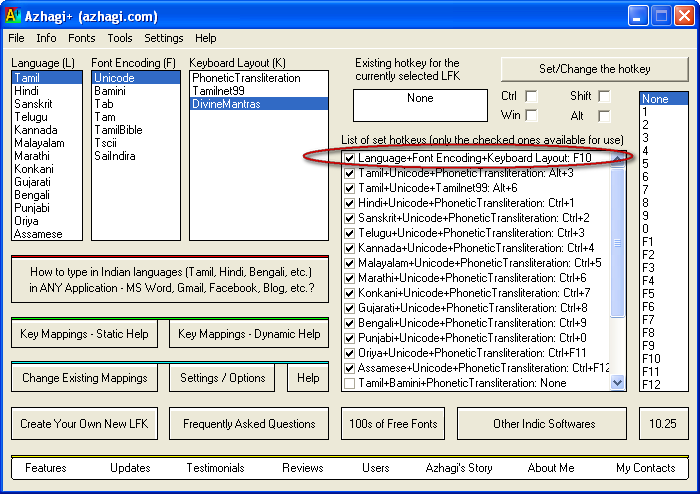 Since primarily Azhagi+ was/is used for typing/transliterating in various world languages, these headings ('Language', 'Font Encoding' and 'Keyboard Layout') were chosen so, initially. Otherwise, 'Language' does not mean one should strictly specify a language's name only as part of 'Language'. Same is the case with 'Font Encoding' and 'Keyboard Layout' too. So, for instance, one can have an LFK as 'Grantha+Unicode+PhoneticTransliteration' too where Grantha is a script. In fact, one can have an LFK (carrying mathematical symbols) as 'Maths+English+Symbols' too. It all depends on how the user wants to readily idenitfy his needs with an LFK or how he wants to quickly remember and recall an LFK. Mr Seshadri Nadadhur (Bangalore) - for typing Sanskrit in Tamil with subscripts (2, 3, 4) appearing automatically for the four different sounds of 'ka', 'cha', 'ta', 'tha', 'pa'. Mr Hariharan Udayasankar - TamilNet99 XML for typing in some Shrilipi/Shreelipi family of fonts. Mr Vijaya Sarathy - TamilNet99 XML file with mappings for numbers 10 to 99 to names of various characters which appear in a divine book he is writing. Except Mr Raguveeradayal, all of them (Basanna Sir is 82 years old) just read what is written in changecreate.html, understood the same and thus did everything on their own. They did not even consult me (except a few of them for one or two mappings). I am mentioning this just to make you understand once again that handling XML files is very simple and easy only. Apart from the above, I am sure there must be some more who must have got benefited by customizing the XML files but not yet informed me. Mr Koteswar conducts training classes on Azhagi+ for railway employees from various parts of India and teaches them how to create new keyboard layouts with one's own key mappings using the easy XML files. For instance, he teaches how to create a new XML file holding the key mappings as presented in Baraha Indic software.